SOUTHPORT, Ind. -- The widow of a fallen police officer is hoping to mobilize a movement to make sure kids know they matter. Her husband, Lieutenant Aaron Allan was killed in the line of duty on July 27, 2017. In honor of her husband, Stacy has created the Facebook page called “First Day Hero ” which she hopes will start a movement that honors her husband by making sure that children across the country know they are loved and that they matter. Hours before his death, Lt. Allan was photographed walking his son to his first day of school. That photo has since been shared around the country and has become one of the most memorable photos of Lt. Allan. Stacy wants you to post a photo of you and your child walking to school along with a word of encouragement and the hashtag #1stDayHero. Friday will mark one year since Lt. Allan was shot 14 times while trying to assist someone in an overturned vehicle. 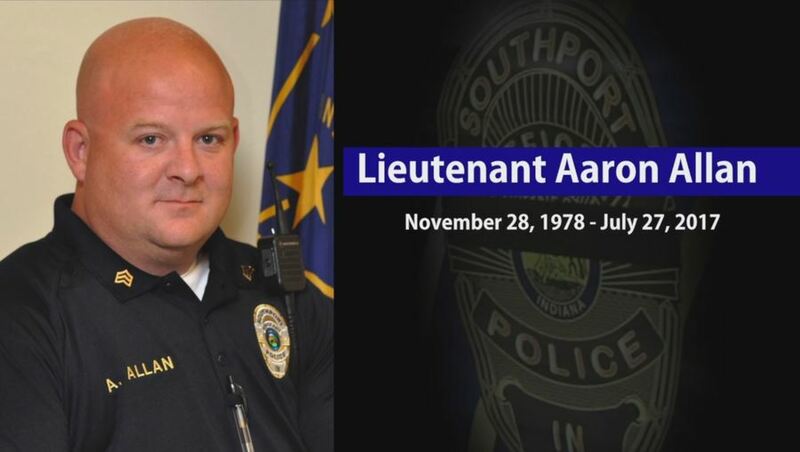 Southport Police Chief Thomas Vaughn says the department is focused on honoring Lt. Allan this year and making sure that his son, Aaron Jr., knows how much he matters on his first day of school. “We are going to make sure that we are there, that we support him going to his new school and that he has a big family around him the first day,” said Chief Vaughn.